When Mohammed Al-Mustafa claimed asylum in the United Kingdom in 2010, the last thing he expected was that, eight years later, the British Home Office would deny him protection, advising him to go back to Palestine, the territory they didn’t believe he was from. This is, unfortunately, a recurrent scenario for thousands of stateless people, seeking asylum in the UK and other European nations. Rejected by all countries, stateless people remain without documentation, thus lacking a basic and fundamental human right: the right to a nationality. According to the United Nations, there are at least 10 million stateless people around the world. In Europe, the estimated figure reaches up to 680,000, although many experts believe the real number to be much higher. Despite international treaties obliging states to guarantee every child’s right to a nationality, most countries are still failing to give stateless people protection. 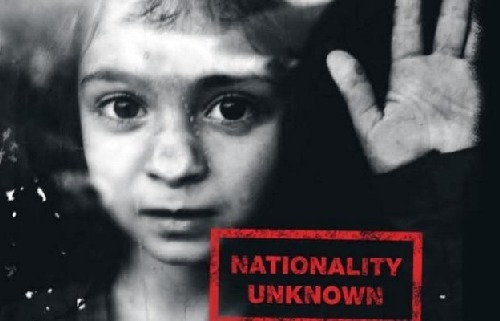 That’s why hundreds of thousands of Roma people remain today nationless in the Balkans or Italy as well as ethnic Russians from the former Soviet Union residing without a nationality in Latvia, Estonia or Ukraine. The circumstances are more drastic outside the European Union and have taken on much greater dimensions with the latest refugee crisis. More than 300,000 Syrian children born in Turkey have been registered as stateless as their mothers were unable to pass citizenship on to them. In Bangladesh, an estimated 700,000 Rohindya refugees remain displaced after fleeing violence and persecution in Myanmar. In most cases, statelessness results in further exclusion, forcing people to live and work outside the law. Without a nationality, they also lack the right to vote, to travel, and face severe difficulties in accessing basic services such as health care, education, housing or employment. Persecuted as minorities, even in countries where sometimes they have been living for generations, people without citizenship are often targets for intolerance. Over six decades since the 1954 UN Convention on Statelessness, it remains a humanitarian plight requiring urgent global action, in order to bring justice to people whose voices remain unjustly ignored.